Have you ever pulled your Thanksgiving turkey out of the oven and realized that you never turned on the oven? Does your family always go around the table and share what you are thankful for? Do you have an unusual dish that HAS to be on your Thanksgiving table every year? 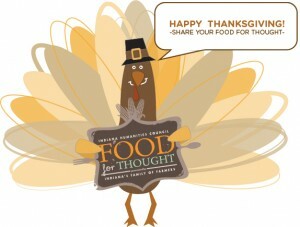 If you have a fun, sweet, or delicious Thanksgiving story, Indiana Humanities Council wants to hear about it! And they are even giving two people $100 towards their Thanksgiving meal (thanks to Indiana's Family of Farmers). The winners will be chosen at random (your story will NOT be judged). The catch...you only have until Friday, November 19 to enter! This is part of the Council's Food for Though initiative, which is a two-year celebration of food and its role in our lives. They have spent the past year encouraging Hoosiers to "Eat. Read. Talk." If you don't have a Thanksgiving story to submit, I still recommend you head over to their web site and learn more about what they are doing. My family usually gathered at my grandparent's house to celebrate holidays. However, one year when I was in college (I think) we decided to have Thanksgiving at my cousin's house. My grandma still fixed much of the meal at her house so my youngest sister went over to help fix the food and transport it. My sister (like me) is not the most graceful person. As she was carrying a very hot pan of gravy out my grandparents' back door and down the steps, she tripped and spilled the gravy down her arms. So, not only did she have burns on her hands and arms, but we also had no gravy for our Thanksgiving table. Can you top that? If so, go here and enter today!